Better late than never. 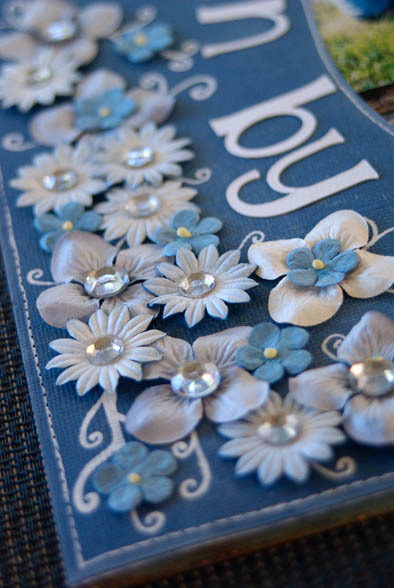 Here’s that layout we saw at the Cricut Day where I used Alpahlicious letters and loaded it up with flowers, gems and white gel pen. Journaling was done in pen, almost hidded amongst the lightly patterned background and the swirl was hand drawn. 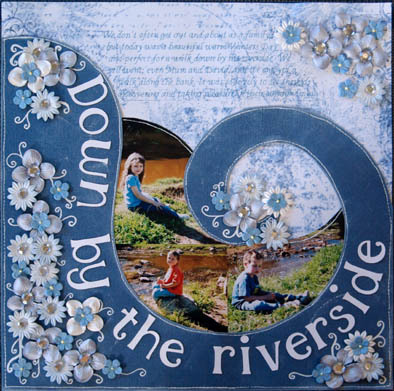 This entry was posted in Cricut Layouts, Design Team Work, Scrapbook Layouts. Bookmark the permalink. Very nice! Are the flourishes around the flowers stamped or hand-drawn? Also love how the journalling looks (in the photo anyway) to be part of the PP- I’d have missed it if you didn’t point it out. Is that hand-written or computer font? – also hard to tell. Beautifil. I have just got the Alphalicious cartridge and its great. Who are those beautiful little people?! The flourishes are hand-drawn with the broad white gel pen (before I owned the flourish stamps) the journaling was supposed to ‘blend’, so that worked! It’s written in a navy zig pen, but I had typed it first onto computer paper, then used my light box to trace it… sneaky huh? The fake stitching was done with my distress wheel (to poke even spaced holes) and over with the white gel. Absolutely gorgeous! I love it! It’s been so long since I scrapped, this gives me great inspiration! 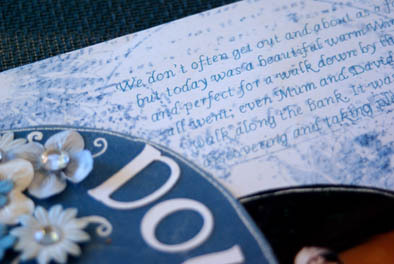 tricky stuff with the journalling- lucky it wasn’t thick cardstock! I thought the stitching was real! I must remember to use my wheel thingy instead of always fighting with the sewing machine hehehe. Wow!!! This looks wonderful. Goin to have to get me a Cricut. Deanna… get out your scrappin stuff right now and create create create! glad to be of inspiration to you. Louise B… probably would have been quicker just to sew, but machine isn’t home, so I made do. Lisa M… yay then you can come to Cricut Days too. It would be quicker for me to do it your way- believe me, it’s not pretty when I use the machine!! Hee hee I’d like to see that! Oh wow, that is just BEAUTIFUL!!!! I must get this layout done, it’s so beautiful whatever papers/colours are used, just beautiful.